Movie Review: 'Nebraska' - A Journey That Goes Beyond The Trip Critic David Edelstein calls the film, in which an elderly man sets out to claim a million-dollar sweepstakes prize, a "superb balancing act" from director Alexander Payne. David (Will Forte, left) and his father, Woody (Bruce Dern, center), take time out of their quixotic journey to stop in Woody's small Nebraska hometown — where Woody's old business partner, Ed (Stacy Keach), is still nursing a grudge. 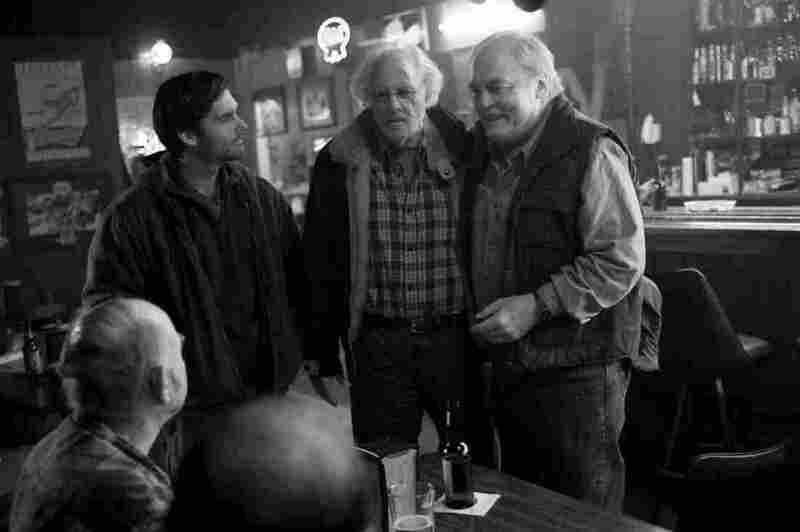 Last month, I saw the trailer for Alexander Payne's Nebraska, and only the fact that it was a Payne film made me want to see it. The premise seemed a dead end: Bruce Dern plays an elderly man named Woody Grant living in Billings, Mont., who gets a letter saying he's won $1 million. All he needs to do is call a number and maybe buy a magazine subscription. Instead of laughing it off, Woody insists on traveling hundreds of miles to company headquarters in Lincoln, Neb., for his fortune — walking if need be. I doubt Payne had much to do with that trailer, but it's awful. Do you want to see another whimsical tale of a puckish elder doing the darnedest things while yokels cheer him on? I admit my prejudice because, in the end, Nebraska is a special kind of triumph — a movie I argued with constantly, but that won me over. It was hard to make an emotional investment in Woody, who's not just wrong about the prize, but ornery, alcoholic and, according to his belligerent wife, a lousy husband and worse dad. Watching it, though, I gave Woody the benefit of the doubt because of Dern, an actor who never quite found a niche but hung on honorably — and incidentally gave us a treasure in his daughter, Laura Dern. Dern always had a runner's gauntness, but as Woody he's painfully thin, with a shock of white hair and eyes that are mostly cast down. When he lifts them, though, they're huge and liquid. It's a beautiful, near-pantomime performance. Nebraska is a road movie, and since Woody lost his driver's license and his family won't let him walk, it all comes down to his son, David. Played by Will Forte, he's an electronics salesman whose longtime girlfriend just decamped. Forte is an ordinary-looking guy with a manic streak that in comedy takes him strange and exhilarating places. He doesn't tap that mania in Nebraska — he's the harried straight man. But his energy keeps the movie bouncing along: David reacts to everything, while his father appears to register nothing. Alcohol as well as age have burned out many synapses, and Woody never was given to talk. The question hangs: How much does the old man see — and feel? The movie's true destination turns out not to be Lincoln but a stopover, the small Nebraska town where Woody once made his life. His extended family is there, and so are many old neighbors and friends — uneasy friends, like the ex-business partner played by a hard, scary Stacy Keach, who says Woody owes him money, and now that he's a millionaire, hand it over. There's a tension between the crabbed characters and the expansive wide frames, heavy on farmland iconography and cows and puffy clouds, shot by Phedon Papamichael in crisp and gorgeous black and white. In one scene, Woody joins his elderly brothers for a reunion. The old men sit in plaid shirts before a TV, trading monosyllables without looking one another's way. It's an easy sight gag, but their fine, weathered features turn it into something mysterious and iconic. Nebraska is a superb balancing act. The whimsy is always cut by settings redolent of alcohol and rust and old-man bars. But it's never too grim. As Woody's hellion wife, the diminutive June Squibb blasts out her putdowns — and brings down the house along with her targets. Bob Odenkirk pairs perfectly with Forte as Woody's more successful son, a TV reporter. And in the end, Payne and screenwriter Bob Nelson pull a rabbit out of their hat. The real journey hasn't been to a silly sweepstakes company; they turn the focus inward and go to the emotional heart of Woody's absurd quixotic quest. Maybe there's no cash at road's end, but we feel like a million bucks.